Mount this alarm on the wall or leave it standing up on a table top. 10 year limited warranty on both the alarm and battery. 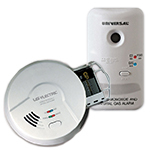 Meets New Laws & Legislations - This alarm exceeds industry standards, and is listed to UL Standard UL2034 and is California State Fire Marshal approved. The Universal Security Instruments MC304SB Carbon Monoxide Smart Alarm provides 10 years of continuous protection against the silent killer - carbon monoxide. Perfect for new or replacement installations, this maintenance-free alarm is suitable for houses, apartments and mobile homes. The sealed battery (included) will never have to be replaced throughout the life of the alarm, giving you a decade's worth in peace of mind even in the event of a power outage. Permanent Power also saves money from battery replacements (up to $38.00 over the 10-year life of the alarm), eliminates annoying low battery chirps and helps the environment by reducing environmental waste from disposed batteries. 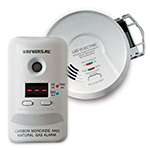 This alarm features microprocessor intelligence to assist in completely eliminating nuisance alarms, a single silence/test button to quiet a non-hazardous alarm and an end-of-service life warning that sounds when it's time to replace the battery (approximately 10-years from activation). Mount this alarm on the wall or leave it standing up on a table top. The quick activation battery pull tab makes it easy to install while the deactivation key switches the alarm off and makes the batteries safe for disposal. Once the alarm is deactivated, the tamper resistant feature turns on to prevent deactivated alarms from being reinstalled. This alarm conforms to UL2034 Standards. It has also been approved by the California State Fire Marshal and Federal Housing Authority (FHA) to exceed industry standards. For maximum protection, install an alarm inside every bedroom, outside every sleeping area and on all levels. The Universal Security Instruments MC304SB Carbon Monoxide Smart Alarm comes with a 10-year limited warranty that covers the battery and alarm. Product was exactly what I needed. Great customer service helped me pick the exact product. 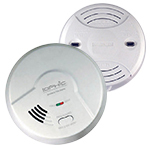 I purchase two MC304SB stand alone carbon monoxide detectors. Installation and testing was easy. Now I need to order 2 more that I shall tie into my security system. Great product, reasonable price, and good installation instructions. Met all my needs when it was most needed. We purchased over 115 CO Alarms to meet a new mandate by New York State. The pricing and quality of the alarms, plus the excellent service provided by Universal Security Instruments made this a no-brainer. I highly recommend.